Since botanical drugs received official FDA status in 2004, more and more established and emerging companies, including large pharmaceuticals, are beginning to develop botanical and plant-derived drugs. As a result, public and private investment in this market is growing. Indeed, as advancements in plant cultivation technology continue to improve efficiency and reduce development costs, botanicals are expected to experience tremendous growth. Globally, the overall botanical and plant-derived drugs market was valued at $25.6 billion in 2015. BCC Research projects the market to reach nearly $35.4 billion in 2020 and register a steady compound annual growth rate (CAGR) of 6.6% for the period 2015 to 2020. However, it is the botanical drug category, those plant-derived drugs that are approved under the FDA botanical drug pathway, that is far and away the fast-growing segment of the overall market. According to BCC's Botanical and Plant-Derived Drugs: Global Markets (BIO022G), this segment alone is expected to surge from $35.9 million in 2015 to nearly $1.8 billion in 2020, to register a phenomenal 117.9% CAGR. 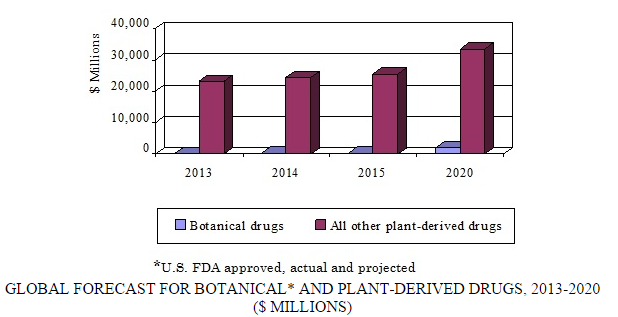 Key factors driving this remarkable growth include an increasing belief among the public that naturally-derived compounds are just better than those that are synthetic; dramatically lower development costs; lack of generic reproducibility for most botanicals when their patents expire; a friendlier regulatory climate for plant-derived drugs; and government initiatives aimed at increasing the amount of botanical drugs in the FDA pipeline such as the NIH Botanical Research Centers Program. Other key factors include increasingly open Chinese, Indian, and other markets for the exchange of materials; fewer on-patent pharmaceuticals in company pipelines; and effective patenting of compounds through the demonstration of novel preparations as in a composition patent. Interest in plant-derived drugs is growing throughout the world for many reasons, including their increasing presence and use in pharmaceuticals. One study found that about 25% of the drugs approved during the period of 1981 to 2002 either were natural products (i.e., plants, microbes, etc.) or based on natural products. In 2010, of the 20 drugs approved by the FDA, 50% of them were natural products or derived from them. Growth in the plant-derived market – excluding botanicals – as a whole is in line with the growth of the overall pharmaceutical market, given the presence of generics and a still-recovering economy. The entry of brands such as Sativex, Picato, and Jevtana will continue to increase growth through 2020. This plant-derived drug market (excluding botanicals) could be valued at approximately 25% of the prescription drug market across its entire timeline; however, a value snapshot at any given time is a fraction of that, given that so many plant-derived medications might have been eclipsed by other like medications or selling in lower-priced generic versions. 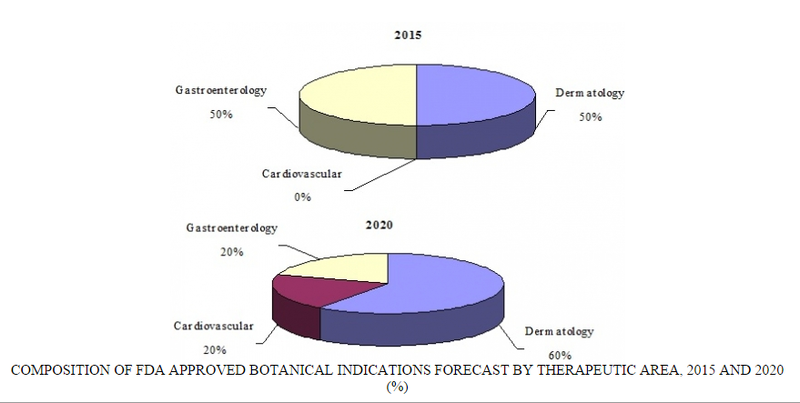 Botanicals, not surprisingly, as a subgroup of all plant-derived medications sold as prescription drugs, are expected to experience growth at slightly higher levels relative to the entire pharmaceutical sector at a CAGR of 6.4% from 2015-2020. Two drugs in the category are approved and three are in line to be approved by 2020. One of those is a cardiovascular drug that would be priced in such a way and prescribed in a wide enough swath so as to generate over $1 billion by 2020. Veregen is moving forward at an increasing pace, in part, because Medigene, its developer, has worked quickly to develop agreements with distributors and marketing partners in countries throughout the world. That botanical drug rose from $4.7 million in sales in 2013 to approximately $5.7 million in 2015 and will again rise to $9.3 million in 2020, again, due to international penetration and an indication that is not uncommon. For example, its indication, genital warts, is believed to have a reported annual incidence globally (including new and recurrent) in the range of 160 to 289 per 100,000. With the average total cost for the development of a new drug at anywhere from $800 million to $1 billion, companies are still looking to those botanical ingredients with long track records as supplements and herbal medicines to use to incorporate or serve as the main drug ingredients so as to bypass some of the guesswork in finding reliable and safe compounds for targets. In contrast to traditional drug development, botanical drug development is approximately $80 million over 10 years with potential average sales of $1 billion. Large pharma companies with known plant-derived compounds in the development pipeline are Sanofi, Novartis and Pfizer. Even smaller companies are recognizing the need to forge agreements and partnerships to ensure viability over the long term given the risk involved in creating drugs. For example, Napo Pharmaceuticals and Salix Pharmaceuticals were the developers of the botanical drug crofelemer, branded Fulyzaq. Large pharmaceutical companies competing in the botanical and plant-derived drug market with small- to mid-sized companies are ranked based on revenue in the following table. Although the emerging Asian markets’ share will grow considerably over time due to increased penetration of botanicals in those regions, North America will continue to be the dominant market for botanical and plant-derived drugs through 2020. Indeed, the U.S. will generate the greatest demand for botanical drugs far beyond 2020 because this market is defining the category and generating the most market demand. The Asia Pacific region, however, is growing quickly relative to Europe or Latin America. “Regardless of size of company, the sellers of drugs, botanical or not, are looking to North American and Asia as both large and fast-growing markets in terms of relatively quick uptake and long-term revenue streams as shown in the figure on drug sales by region,” says BCC Research biotechnology analyst Kim Lawson.